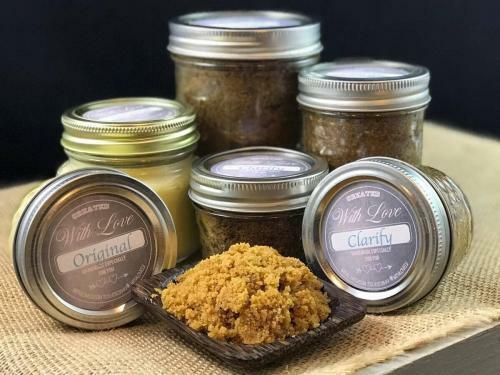 Clarifree Face Scrub ~ With Love and Co.
An all natural, deep cleaning scrub for acne prone skin, blemishes, and areas of unnatural dark coloring. These items have a tendency to cause staining if not thoroughly washed from the skin. Clarify Facial Scrub reduces inflammation and fights the prime acne and ingrown hair perpetrators like dirt, oil and pore-clogging dead skin cells. During the day your face is exposed to endless chemicals, pollutants, bacteria, sunlight, and more. Draw those harmful materials out of your skin with our scrub. Your complexion will be thanking you for a daily detox, leaving you feeling moisturized and refreshed! Fight against acne, blemishes and stubborn blackheads. Cleanse and minimize pores, exfoliate dull/dead skin cells and moisturize to the base of your skin with each wash. Works to brighten skin tone, eliminate dry skin and irritations. Reduces oils and skin impurities while boosting immunity to increase wound healing. Our beautifying scrub ensures your skin will be cleansed and left soft and smooth – never tight or irritated. Our natural exfoliating scrub will give you a glowing, beautiful complexion. The clarifree option removes the turmeric and matcha green tea. Scrub: If you are in the shower, wash your hair first. Wet your hands and face, take a quarter sized amount (relative to the affected area) and massage into wet skin to cleanse, lightly exfoliate and detoxify skin. If you are having a current breakout, mix in an equal amount of raw honey. Rinse thoroughly or use a warm wet washcloth (your preference) to remove any residual scrub. Follow by gently putting on a small amount of Body Butter or Healing Balm. Mask: Take a quarter-sized portion (relative to the affected area) and mix with a small amount of water in your palm until fairly smooth. Apply to face and leave on until you feel tingling, but no longer than 5 minutes. Rinse thoroughly or use a warm wet washcloth (your preference) to remove any residual scrub. Follow by gently putting on a small amount of Body Butter or Healing Balm. Men: This scrub will take the place of your pre-shave oil. Prior to shaving wipe off any excess oils with warm wet washcloth to ensure an easy time and to avoid having to unclog your razor more often. WARNING: This Clarify scrub contains turmeric which will stain your towels, so be sure to use colored towels or towels you don’t mind having an extra bit of character. This is an essential ingredient for combating inflammation and pain, that also promotes healing and regeneration of healthy skin cells.